Now, my Windows is already set up to use Git, so I was a bit surprised to see that after logging in, I have to configure my full name and email. And GhW also automatically generates a new key which it authorizes at Github, even though I already have one set up. I guess that GhfW uses an isolated "We'll make everything just work (tm) for you" configuration somewhere, and I can see the reasoning for that. It scans my homedir for repositories and prompts to import them, that's nice. Some of my local repos aren't hosted on Github, and it's nice to see that you can use GhfW for other repos as well, but I have no idea if my existing SSH-key authentication will work. After importing some repos initially, I can't figure out how to import further repos. There's probably a button for it somewhere, but I can't find it. After playing around for a few minutes, this is a recurring thing for me in this modern Metro style interface: I look around for a good few seconds before I find the button for what I want to do. It's just too unclear to me what is actually clickable, and what are just text or icons. Actually most text and icons are clickable, but my brain just doesn't cope with that yet. A little later: Eureka! 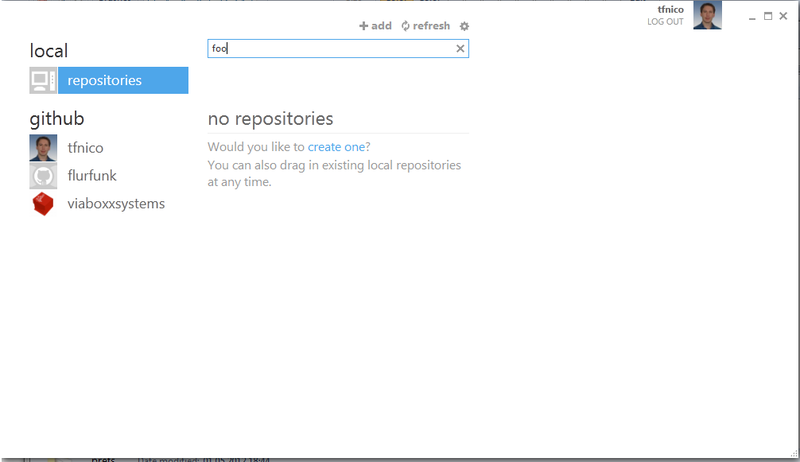 In order to import another repo, I have to drag it in from Explorer! I got that instruction by entering some text into the repository filter. See, that's what I mean. Some things can be right-clicked (repos, local changes), many cannot (commits). It takes a lot of clicking around to figure these things out.. Couldn't they build some conventions into the color scheme or something like that? I wonder if the designers have done any usability tests on this.. I noticed a few bugs at first, like cryptic failure messages when pushing fails in mis-configured repos, and double-clicking below the list of repos will open the top one. Then it got a bit nasty: I manage to land in a state where GhfW says the work tree is clean. 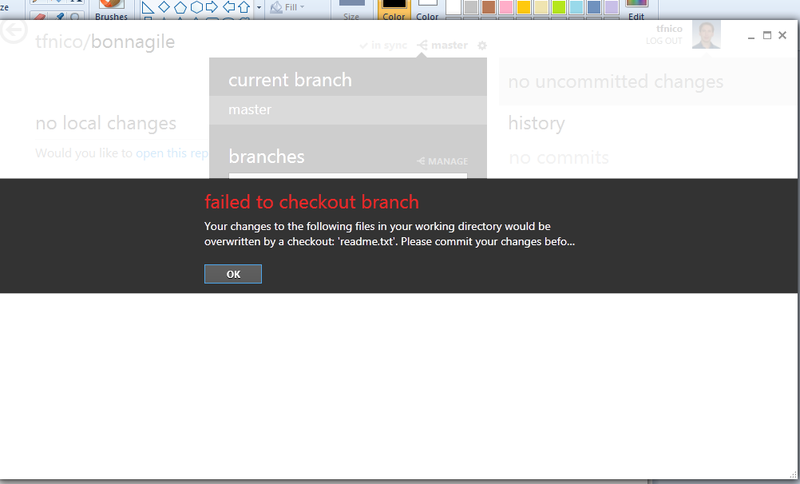 Then it complains when I try to check out a branch, and shows me there are uncommitted changes (looks like there's some problems going on with line ending conversion there). No local changes (background), but you have changes. So, it could be that my installation is a bit messed up because of my existing .git settings or something like that, cause I don't think they would've shipped it everyone are having these problems. The situation above occurred in a repo where I had worked with Windows line-endings checked in, and it could be that this conflicted a bit with how GhfW wanted to work things. They don't prompt you on how to handle line-endings during installation, so they must have some smart way of handling that, and maybe that failed in this situation. 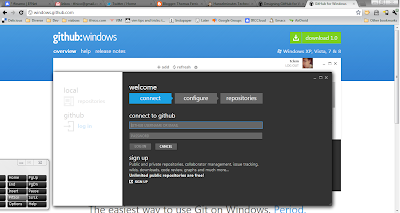 I really like the rationale behind GhfW, which is making it super easy to get started with Git for Windows users. 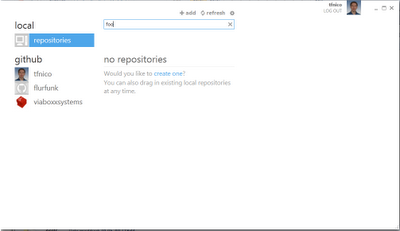 It certainly is easy to install, start new repos, and get them in and out of Github. And they also do install a Git command line, in case you want to go beyond the GUI. The GUI is really nice, but it takes a bit of getting used to if you are new to Metro, I suppose. For me, it feels a bit too buggy still, and a bit too alien that I could just recommend it to a complete Git newb, even if it was rock stable. I suspect that they are aiming this product for a user group (I'm guessing suits in companies that buy Github's enterprise stuff) who will not be able to figure it out, and they need to do some usability testing here. There are some more interesting notes on the design on Github's blog. Published at DZone with permission of Thomas Ferris Nicolaisen . See the original article here.